When green beauty newbies ask me what to use for makeup remover, I always recommend something along the lines of olive, jojoba, sunflower or grapeseed oils. Each on its own is stellar at removing makeup and allowing enough slip for your evening facial massage, but when combined? Look out. You’ve got yourself a powerhouse oil cleanser loaded with nutrients. And if you’re using the one made by Josh Rosebrook, you’ve also got yourself a bottle brimming with beneficial herbs and essential oils designed to soothe your skin and your senses. 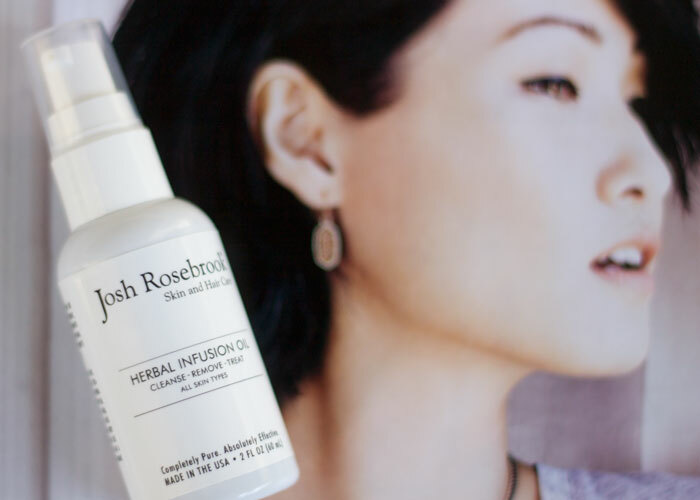 Formulated as a multi-use treatment oil, Josh Rosebrook’s Herbal Infusion Oil serves as both a makeup remover and a healing, moisturizing skin treatment for all skin types. It takes me about 5-6 pumps to have enough oil to comfortably massage around my face and break down the #MOTD. This is about a quarter-size; the pump dispenses a very modest amount, and the bottle easily lasts a few months with nightly use. It’s gentle enough to use everyday to remove regular daytime makeup, heavy eye makeup and even sunscreen without experiencing redness, irritation or eye discomfort. Sometimes even the best-made oil cleansers and makeup removers that combine a variety of ingredients are just a little too much for the delicate eye area. They either pull and tug at the skin (you need enough slip! ), or contain irritating ingredients that leave you with red, teary eyes. Not this one that’s made with organic oils of olive, jojoba, sunflower, grapeseed, sesame, apricot and almond. It also includes, in classic Josh Rosebrook style, organic herbal infusions of calendula, slippery elm, marshmallow root, bilberry, neem, alfalfa, skullcap, fennel seed, chickweed, ginkgo leaf, hawthorn berry and green tea. Olive Oil: Rich in vitamins K and E, helping to reduce dark circles and offering protectiong against photoaging. Grapeseed Oil: Loaded with antioxidants, vitamin E, vitamin C, Beta-Carotene and vitamin D.
Sesame Seed Oil: Packed with vitamin E, lecithin, minerals, proteins, and amino acids and is antibacterial, antifungal and anti-inflammatory. Josh Rosebrook’s Herbal Infusion Oil has — you guessed it — an herbal scent that’s somewhat sweet thanks to calendula flowers and marshmallow root. This comforting scent also makes the oil a lovely daily moisturizing oil, if you’re trying to pare down your products and use some truly multipurpose-yet-luxurious formulations. I reserve this oil for cleansing only, but in a pinch (or during travel), it’s a no-brainer to use as both a cleansing oil and treatment oil. The active herbal infusions really do it all: Cleanse, detoxify and treat blemish-prone skin. One thing that really puzzles me about this oil is its ability to feel extremely lightweight and airy, yet have enough slip and moisture to it to move freely as I’m massaging my face. Many oils designed for cleansing and makeup removal feel thick and heavy (even some of the carrier oils on their own!). Some oils that are too light absorb way too easily — a positive for a facial oil, but not exactly what you want in a cleansing oil. Bravo to Josh for truly perfecting the art of the multipurpose cleansing and treatment oil. This is a definite repurchase and recommend. Have you tried Josh Rosebrook’s Herbal Infusion Oil? What carrier oils are your favorite? What do you look for in an oil cleanser? Tell me in the comments section!